This is a simple sandwich recipe which uses only boiled eggs and a few vegetables. It can be a good idea for using the Easter dinner leftovers for the next day’s breakfast. Heat water in a pot until you bring it to boil, then add the eggs. Boil them for 4 minutes, then cool them in cold water. Slice them carefully with a thin bladed knife (serrated knives are not good because they tend to rip the yolk up). If you have a cheese slicer use that instead of the knife. It works beautifully. Butter the bread slices. 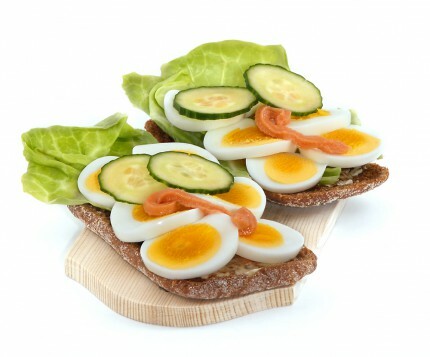 Put a lettuce leaf on each slice, then arrange the egg slices on top of it. Add the cucumber slices and tuna spread.